SAN DIEGO, California, October 26, 2011 (ENS) – In the first case to apply the slavery amendment of the U.S. Constitution to non-human creatures, animal rights and marine mammal advocates today asked a federal court to declare that five orcas are being held as slaves by SeaWorld Parks & Entertainment. The lawsuit is based on the text of the 13th Amendment, which prohibits the condition of slavery without reference to “person” or any particular class of victim, says general counsel to PETA, Jeffrey Kerr. “Slavery is slavery, and it does not depend on the species of the slave any more than it depends on gender, race, or religion,” Kerr said. 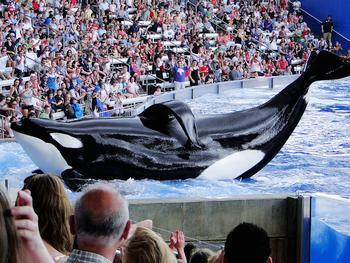 “The 13th Amendment prohibits slavery, and these orcas are, by definition, slaves,” Newkirk contends. The five wild-captured orca plaintiffs are Tilikum and Katina, both kept at SeaWorld Orlando; and Kasatka, Corky and Ulises, all three confined at SeaWorld San Diego. The orcas are represented in the lawsuit by what the law refers to as their “next friends.” These people are Ric O’Barry, a former orca and dolphin trainer and the star of the Academy Award-winning documentary The Cove; marine biologist and orca expert Dr. Ingrid Visser; Orca Network founder Howard Garrett; and former SeaWorld trainers Samantha Berg and Carol Ray, as well as by PETA. The plaintiff animals are members of the Orcinus orca or “killer whale” species, the largest species of the dolphin family. “Orcas possess sophisticated learning, problem solving, and communicative abilities. They also possess distinctive cultural traits,” states the complaint filed in court. “In nature, orcas engage in many complex social, communicative, and cognitive behaviors, including learning-based cooperative hunting strategies and cultural variation among pods and generational transmission of unique cultural traits,” the lawsuit argues. “The orca brain is highly developed in the areas related to emotional processing (such as feelings of empathy, guilt, embarrassment, and pain), social cognition (judgment, social knowledge, and consciousness of visceral feelings), theory of mind (self-awareness and selfrecognition), and communication,” the lawsuit states. At SeaWorld, they are forced to swim in circles in small, barren concrete tanks. Deprived of the opportunity to make conscious choices and to practice their cultural vocal, social, and foraging traditions, they are compelled to perform meaningless tricks for a reward of dead fish, the animal rights organization says. Orcas in the wild live long lives, with males living up to 60 years and females living up to 90 years. In contrast, the lawsuit contends, the mean life span in captivity is just 8.5 years. While some commenters on PETA’s website support the lawsuit, others take issue with use of the U.S. Constitution as a means to free orcas held in captivity.